From an investment point of view, most of us say good riddance to 2008. The economy for 2009 is shaping up to have a rocky start, but I’m optimistic that stocks will rebound at some point. Don’t take that as a prediction, though. I don’t want to be just another commentator whose predictions are wrong half the time. For anyone fascinated by Warren Buffett and his extraordinary investing career, Alice Schroeder’s The Snowball: Warren Buffett and the Business of Life is a must read. At over 800 pages, it adds much detail to the scattering of facts that most people have about Buffett’s life. Any attempt to summarize this book in a few paragraphs would be hopelessly superficial: he was young, then middle aged, and then old. So, I’ll focus on one aspect: the perception that he is a simple folksy person who doesn’t know much about newfangled things like computers and the internet. In some ways this perception is accurate. He does tend to live simply, except for flying around in private jets to meet the rich and famous. He also has the ability to explain things simply and briefly. However, the work he puts into his investing is neither simple nor brief. He has spent most of his life consuming and analyzing financial data. He is well-known for avoiding technology stocks. He explains that he doesn’t understand them and has to stay within his circle of competence. I think that many people misunderstand this explanation. Given the time that Buffett puts into his investing work, it is inconceivable that he hasn’t examined technology companies. It may not be a big fraction of his time, but the total amount of analysis would be considered high for other people. It’s not so much that Buffett can’t understand what these companies do; it’s more that he can’t understand why any of these companies have any durable competitive advantage. Maybe the reason he can’t understand this is because none of these companies really has a durable competitive advantage. It seems very likely that Coke will continue to earn profits for the next 20 years. But how confident can we be that the same will be true of Microsoft, Intel, IBM, Google, or any other technology company? I’m not saying that technology companies are necessarily bad investments. They just don’t fit Buffett’s search for a margin of safety. Although Buffett’s public remarks contribute to the impression that he is a simple guy who doesn’t understand technology, the truth is more subtle. 1. Million Dollar Journey had a guest post by Julie Broad busting myths about investing in real estate. This is one of the more sensible articles about real estate investing that I’ve read. 2. Larry MacDonald examined Bernard Madoff’s $50 billion Ponzi scheme and noted that given how little information Warren Buffett gave his early investing partners, they could not have known whether he was running a Ponzi scheme. It seems that judging a money manager’s honesty is as important as judging his competence. 3. Canadian Financial DIY found a web site that tries to measure the reading level required to understand a given blog. He had mixed feelings about his blog being judged to require a genius reading level. My blog got the same rating, and I have the same mixed feelings. I’d like to think that my readers are all geniuses, but I doubt that you have to be a genius to understand what I have to say. If you have a sense of humour about religion, you might want to check out Armageddon Cable News by the authors of the book How to Profit from the Coming Rapture. Apparently it’s possible to plan for being left behind at the rapture. The US Office of Thrift Supervision has developed new rules to put a stop to some nasty practices of credit card issuers. The fact sheet they put out describes the major changes. This is good news not only for consumers but also for the credit card issuers who were already following these rules because their competition will be forced to play on a more level playing field. Most of the new rules are self-explanatory. Interest rate increases must take place at defined times with adequate notice for card holders. Consumers must be given at least 21 days to make a payment. A fairly substantial change is the rule ending double-cycle billing where the average balance over two months is used to calculate interest. This practice causes interest to continue for another month after you pay your bill in full. Now interest will be based on just the current month. The last new rule places restrictions on predatory high-fee subprime cards. These are high-fee, low-limit credit cards given to people who are poor credit risks. In some cases the fees chew up most of the consumer’s borrowing limit right away. The new rule says that if fees exceed 25% of the available credit limit, then they have to be spread out over at least 6 months. 1. 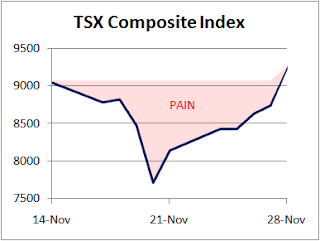 A technical glitch kept the TSX closed on Wednesday. This is a big deal for those who make money from stock trading, but it shouldn’t matter much to investors who aren’t hyperactive. I’d be happy if stock markets were only open one day per week. 2. Larry MacDonald takes the Canadian Real Estate Association and the media that reports their figures to task for misleading the public about movements in house prices. 3. Million Dollar Journey turns the advice to spend less than you earn on its head and suggests that you could try to earn more than you spend. 4. The Big Cajun Man wonders whether assets under management in mutual funds have dropped more due to investor redemptions or dropping stock prices. There are many times when you have to choose whether to “do it yourself” (DIY) or hire someone to do a job. This choice comes up with house repairs, investing, landscaping, to name a few instances. We tend to think of the choice as binary: either DIY or hire someone. However, there is a middle ground. Let me use an example to illustrate my middle ground approach. I have a large natural gas pool heater that became flaky after about two years. I have no training with these heaters and had little choice but to call a repair person. It turns out that fixing natural gas heaters is specialized work and calling in the repair person wasn’t cheap. I always had to pay for some minimum time plus the cost of some expensive part that had to be replaced. The repair person would get the heater working, but the flakiness never went away. During the fourth service call in two years I did my usual thing of watching the repair guy and asking questions. This guy happened to mention that the controls on my model of heater had a tendency to get corroded. In addition to charging me for some part that didn’t really need replacing, the repair guy jiggled some connectors. The heater worked fine for two years after that. So, I paid over $1000 in repair bills before I finally learnt that the problem had been flaky connections the whole time. Ever since then I routinely undo a few screws, pull off the connectors and reconnect them. All the flakiness is gone. What has all this got to do with a middle ground between DIY and hiring an expert? Even when you pay an expert, you should learn something about the work being done. This will make you a more informed user of the expert’s service and may allow you to do it yourself the next time if you choose. Experts I hire differ in how they deal with having me pepper them with questions. Some like it and some don’t, but I do it anyway. I prefer to learn a little. I don’t like to be the one paying experts for something I can easily handle myself. When it’s not so easy to do myself, I keep hiring the experts. Alice Schroeder’s fascinating biography The Snowball: Warren Buffet and the Business of Life makes it clear that Buffett engages in market timing in the sense that he varies his allocation to stocks over time. If he does it, why shouldn’t we? Of course, Buffett’s market timing is different from the investor who makes short-term bets on whether stocks will go up or down. Buffett looks for attractively-priced stocks, and during some time periods he finds them and sometimes he doesn’t. 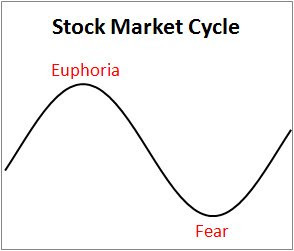 This is still a form of market timing, though. It’s easy to show that market timers as a whole must make less money than buy-and-hold investors, on average. It’s simple mathematics that the extra trading costs along with investing in inferior asset classes like cash and bonds must hurt the average market timer’s returns. This doesn’t mean that all of them lose to the market averages, though. Buffett is a remarkable example of someone who has beaten the odds so convincingly that he must have talent that almost all of the rest of us lack. In some ways the situation is similar to playing poker. Because the house takes a slice of every pot, it is simple mathematics that the average poker player must lose money. But, this doesn’t mean that all poker players lose money. The big poker stars seem to win reliably enough that they have skills that most of us don’t have. So, if you’re going to play poker or try to beat the stock market averages through some form of market timing, you should convince yourself that you’re not just above average, but well above average. But be warned that the majority of people who convince themselves that they are well above average will be wrong. With the BCE takeover officially dead, BCE has announced that they will resume their dividend and start buying back shares. Just about everyone knows what a dividend is, but many investors may not understand what it means to buy back shares. After all, what sense does it make for a company to buy itself? For the uninitiated, it may be disturbing to learn that the number of shares in a company does not remain constant. Many companies issue new shares over time, and this dilutes each shareholder’s ownership in the company. There are many reasons why a company would issue new shares and they all have to do with paying for something. Stock options, when exercised, usually cause the company to issue new shares. A company might choose to raise money by making a secondary offering of new shares to the public. Corporate takeovers of other companies are often financed by issuing new shares. All of these things dilute the ownership of existing shareholders. Is this a bad thing? Well, that depends on what the company gets in return for the shares. If they get more value than they give up, then this dilution actually helps shareholders. Otherwise, it hurts them. It’s also possible for the number of outstanding shares to shrink. When a company thinks that its shares are undervalued, it can help its shareholders by buying its own shares on the open market and retiring them. So, if BCE buys back 5% of its outstanding shares, shareholders who hold on to their shares will see their fraction of ownership of BCE rise by about 5%. Is this a good thing? Again the answer comes down to whether the company gives up more than it gets. If the shares truly are undervalued, then this helps the shareholders who keep their shares. Otherwise, it hurts them. Let’s illustrate this with the traditional lemonade stand example. Suppose that there are 100 shares in a lemonade stand that has $500 in cash and expects $1500 in future profits. Then each share is worth $20. Suppose that some shareholders are pessimistic about future earnings and are willing to part with their shares for $10. If the lemonade stand uses the $500 cash to buy back 50 shares and retire them, then there will be only 50 shares remaining to divide up the $1500 in future earnings. So, shareholders who don’t sell get to watch their shares rise in value from $20 to $30 each. But what if the weather is about to turn bad and future earning are destined to be only $100? Before buying back shares, the business had $500 plus $100 in future earnings, or $6 per share. After the buyback there are only 50 shares to divide up the $100 of future earnings, or $2 per share. So, we see that whether a stock buyback is good or bad depends on whether the stock is under- or over-valued. 1. The state of Illinois will stop doing business with the Bank of America. Governor Blagojevich is upset that the bank received $25 billion of taxpayer money in a bailout, but refuses to restore credit to a Chicago business. Is it possible that this type of political interference had something to do with the bad loans that caused the credit crisis? Amusingly, a couple of days later Blagojevich was arrested for a “political corruption crime spree” that included trying to sell Obama’s recently vacated Senate seat. Then he decided to ignore Obama’s call for his resignation. Sounds like a soap opera. 2. Larry MacDonald kicks the tires on a new way to measure house prices that promises to be more accurate than the old method of just averaging recent sale prices. 3. Million Dollar Journey discusses an important lesson in real frugality. For items you need for the long-term it’s important to focus on dollars per unit of time rather than just one-time cost. 4. Jonathan Chevreau reports that electronic sales suppression software is available for sale (the web page with this article has disappeared since the time of writing). This software helps businesses cheat on their taxes by eliminating records of a fraction of point-of-sale transactions. CRA’s strategy to catch those who sell this software seems to be to get honest businesses that are approached to contact law enforcement. 5. The Big Cajun Man discusses the perfect storm of snowfall and a transit strike causing major traffic snarls. He’s happy that at least gas prices are low, but that contributes to the traffic problem. It may seem obvious when you think about it, but the stock market and the economy aren’t exactly the same thing. Some commentators seem to confuse the two. There is no doubt that they are related to each other, but they don’t always move in the same direction. The stock market reflects the going price for businesses that are at least partially owned by the public. The economy includes these businesses plus privately-owned businesses, bond markets, currency markets, governments, jobs, etc. Stock prices are a consensus view of the expected future profitability of public businesses. This makes the stock market forward-looking. Sometimes the crystal ball is cloudy and stock market participants get it wrong, but stock price movements tend to precede changes in the economy. We have seen this lately in media stories. As stock prices dropped, we heard story after story of gloom and doom about the stock market. This has largely given way now to gloom and doom about the economy. Apparently we’re all going to lose our jobs and have to start flipping burgers for a meagre living. Unfortunately, this really will happen to some of us. If past patterns repeat, we can expect stock prices to rise before we pull out of recession. But don’t take this as a prediction from me. Short-term stock market movements have a way of surprising us. My wife and I have always maintained separate bank accounts. It never really occurred to us to do all of our banking with joint accounts. I’ve often wondered what it says about a couple when they make one choice or the other. It’s not that I have my money and my wife has hers. Since we were married it’s all been our money. If I happen to be short on cash, she’ll just give me $100 from her wallet without keeping track. If her bank account gets low for some reason, I’ll just write her a cheque. Sharing a bank account feels sort of like sharing a toothbrush to me. It can be done, but you’d have to be in quite a romantic mood to think that sharing a toothbrush is a good idea. It just seems like a pointless hassle to balance a chequebook when two people are making withdrawals. Misunderstandings with joint accounts must lead to the occasional bounced cheque. It’s possible that having separate accounts but not really keeping our money separate is only possible because we both tend to be frugal. Maybe other couples have to keep track of each other’s spending. A joint account might help with monitoring each other. Alternatively, having “her money” and “his money” is probably more easily done with separate accounts. Perhaps getting a joint bank account shortly after getting married is a symbolic gesture of commitment like wedding rings. If you’re not sure what to do and you want to be like other people, a joint bank account seems like the right choice. There are probably some good reasons to have joint accounts. My wife and I actually have one joint account for a technical reason to do with transferring money years ago, but I think of it as hers and never touch it. Does anyone have any thoughts in support of joint accounts? Experts differ on which is the best approach to investing throughout your life. Some say to maintain a fixed percentage allocation in stocks, bonds, and cash regardless of your age. Others advise a lifecycle approach where you invest heavily in stocks while you’re young and shift to bonds and cash as you get older. Larry MacDonald reported on a recent study by researchers Basu, Byrne, and Drew titled Dynamic Lifecycle Strategies for Target Date Retirement Funds (full text of the study is available free). The title hints at a market-timing strategy which piqued my interest. 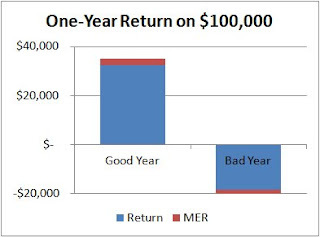 - If your compound average lifetime return so far is less than 10%, then invest 100% in stocks. - If your lifetime return exceeds 10% per year, then use the allocation dictated by a lifecycle strategy (more stocks if young and less if old). So, this dynamic strategy has a built-in sense of how much the investor needs at retirement. 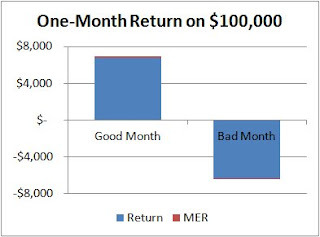 The strategy gets conservative when returns are on track, and goes for broke with all money in stocks when lifetime returns are under par. One finding from the study is that this dynamic strategy tends to beat the lifecycle strategy. This is hardly surprising because, on average, the dynamic strategy will have more money invested in stocks over the years, and we know that stocks tend to beat bonds and cash over the long run. One aspect of the dynamic strategy that concerns me is that if the portfolio gets behind on its target return, it stays 100% in stocks right into retirement. 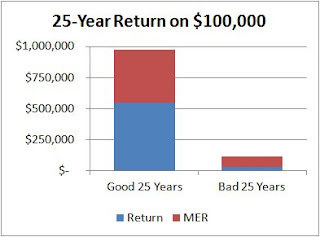 This tendency to go for broke assumes that if you miss your target retirement dollar figure, it doesn’t matter how much you miss it by. However, if you were hoping for $2 million, you’re still better off with $1.5 million than just $1 million. Apart from this problem with the dynamic strategy, there is a lot to like here. For investors who are behind in the amount they have saved, it makes sense to invest more in stocks to catch up. For those whose savings are well on track to give them as much as they need, it makes sense to get more conservative, sacrificing excess returns for greater safety. 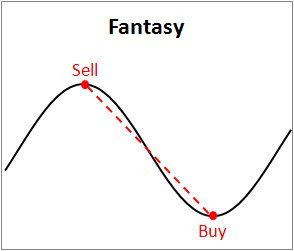 In the never-ending search for the best investment approach, I suspect that including some amount of this dynamic strategy is better than just sticking with a pure fixed allocation or a pure lifecycle strategy. 1. Some algorithm at Google thinks this blog might be spam. This is silly of course, but it’s hard to argue with binary code. By contesting this, I’m now in a penalty box where to make a post I have to solve a CAPTCHA (one of those twisted up words you type into a box to prove you’re a person). I’m on some list to be checked out by an actual person at Google. If this blog ever disappears completely, you’ll know that something went completely wrong. 2. BluntMoney observes that it’s harder to spend money you’ve saved up. This is quite true. Found money often gets wasted quickly. 3. I had some plumbing problems this week and so did the Big Cajun Man. Fixing leaks yourself only saves money if you don’t end up calling a plumber anyway. 4. Now is the time of year to think about your capital gains and losses. FrugalTrader explains tax-loss selling. My wife is quite frugal and often comes home from grocery shopping with a cut of meat sold at half price that has to be cooked within a day. We don’t seem to have had any problems eating these cuts of meat, but they leave me a little uneasy. I presume that the reason for the price discount is that these cuts are older than the full-price cuts. Presumably this means that the odds of getting sick from eating discounted meat are higher. I’m wondering how much higher. I’d like to say that we’ve never had a problem eating discounted meat, but it’s hard to know for sure. We don’t seem to have had any serious incidents of food poisoning, but minor bouts of stomach upset are common and hard to attribute to any particular cause. Most likely the risk from eating discounted meat pales in comparison to the risk of driving a car. I’ll probably continue to have a flicker of uneasiness when I’m told that dinner includes half-price meat, but only a flicker, and then I’ll dive in. My personal experience with trips to hospital emergency rooms is that wait times have increased over the last 25 years. Numerous newspaper articles on the subject seem to indicate that the trend to longer waits exists across Canada. My latest data point came when my son broke a finger playing basketball. He made a nice play stealing a pass and drawing a foul and was rewarded with a finger not quite pointing in the right direction. My wife and I took a deep breath at the thought of a long wait at the hospital, but we had little choice. At least only one of us would have to wait with our son. Sadly, I couldn’t find my two-headed coin when we were deciding who would stay. The wait to see a doctor was less than I feared at just over 5 hours. However, I can recall trips to the hospital for my own injuries decades ago when I waited less than an hour to see a doctor. What has changed? In thinking about the root cause, I see the problem at ultimately coming from government debt. The Canadian government ran deficits through the 70s, 80s, and into the 90s. Turning this around in the mid-90s required cuts in government spending. While there may be individual people, organizations, and political parties to blame for particular aspects of our current health care problems, once the debt had been built, funding pressure on our health care system was inevitable. Andy’s reaction is more typical than Sue’s. The pink region in the chart measures Andy’s psychological pain of watching stock prices sit well below where he hoped they would be. It’s like watching your favourite sports team when they’re way down. Even if they close the gap somewhat, fans suffer psychologically while their team trails badly. Andy isn’t wrong. After all, he knows his own feelings. 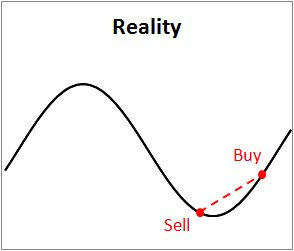 But, the way he perceives the stock market may cause him to make choices that hurt his long-term returns, such as selling at a low point. 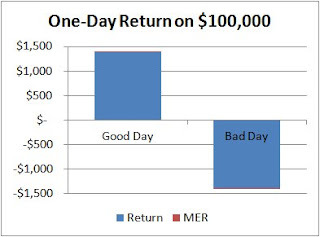 The truth is that the past two weeks have been good for investors’ returns (as long as they didn’t sell), even if it made many of them ill.
Sue’s temperament is better suited to investing success. She ignores the pattern of prices during a period where she didn’t trade stocks. In a month, she won’t care what prices are like today. Although individual stocks can fall to zero permanently, you’ll have much bigger things to worry about than money if the entire stock market goes to zero. Sue remained calm and trusted that stock prices would rebound eventually. Stocks may drop again in the short term, but it won’t be permanent. 1. After the BCE share price plunge on news that KPMG might not approve the buyout, Larry MacDonald thinks BCE might be a good buy for the short term even if the buyout really is dead. 2. BluntMoney argues that we need to cover more than the bare minimum of expenses in our emergency funds because we will find it difficult to give up our lifestyle-related spending in a financial emergency. 3. Frugal Trader explains how to use a Cash Flow Dam to turn a debt with non-tax deductible interest into a debt whose interest is tax-deductible. 4. Big Cajun Man doubts that most people are willing to pay fees to dispose of hazardous waste. 5. Preet explains different ways of weighting stocks in an index with some clear examples: cap-weighting and fair-value weighting part I and part II. 6. The blog Disciplined Approach to Investing hosted the Investing Carnival. When I’m invited to a wedding, I usually buy the happy couple a gift from their wedding gift registry. Until recently, I just assumed that the list contained items the couple really want at prices they consider reasonable. Recent discussions with two couples cast doubt on my assumptions. In both cases, the couples’ attitude seemed to be “we might as well put everything on the list and see if someone pays for it.” It was clear that they didn’t concern themselves much with whether they really want the items, and they certainly didn’t care about price. In the case of one of the couples, I had a chance to continue the discussion a little further, and it became clear that the salesperson helping them create their list definitely encouraged the “put it on the list and see what happens” attitude. It seems obvious enough that this approach is bad for both gift buyers and the couple getting married. Gift-buying guests have a limited amount of money to spend. If the registry contains expensive things that the couple don’t really want, then money gets diverted away from the things they do want. It isn’t surprising that some couples compile their gift registries carefully and some foolishly. But which is more common? I would have bet on “carefully” before listening to these two couples. I can’t say that I’ve discussed wedding gift registries with very many people, and so these two couples represent a fairly high proportion of my very limited sample space. I’m interested in reader experiences on this subject. It seems doubtful that anyone has collected data on the thoughtfulness of gift registry lists, but if anyone has, I’d like to hear about that too. A reader had some thoughtful comments and questions about my analysis of the Manulife IncomePlus annuity. Here are his comments (edited for brevity) followed by my thoughts. 1. You describe the worst case scenario in which an investor makes withdrawals beginning in the first year. The product is best suited to the investor who leaves cash in the investment for at least 15 years so that the guaranteed income grows at 5% per year (albeit simple rather than compounded) for that period. An example will help here. Our investor Ida puts $400,000 into IncomePlus. In my earlier analysis of IncomePlus, I focused on the case where Ida draws a guaranteed income of 5% or $20,000 per year for the rest of her life. But, suppose that Ida is only 50 years old and doesn’t need any extra income until she is 65. IncomePlus rules permit Ida to defer payments for 15 years and then collect a guaranteed $35,000 per year for the rest of her life. This figure came from increasing the $20,000 by 5% (not compounded) for each year Ida deferred payments. On the surface, $35,000 per year sounds not too bad. But this ignores inflation. Even if inflation averages only 3%, Ida will only get $22,500 in today’s dollars in the year she turns 65. By age 90, this drops to $10,700. If inflation averages 5%, this is $16,800 at age 65 and less than $5000 at age 90. Pass the cat food. If Ida lives to age 90, her guaranteed $35,000 per year amounts to a 3.03% per year return on her original $400,000 investment. If she dies younger than this, her return is even worse. This investment has all the inflation risk of a long-term government bond, but with lower returns than a bond. 2. You describe scenarios where the market performs poorly for 20 years. It’s true that I’ve focused on the income guarantees. The point is that the guaranteed income is very low because of decades of inflation. However, it is possible for the guaranteed level of income to rise if our investor Ida’s mutual funds within IncomePlus perform well. Unfortunately, they have to perform very well to overcome the very high fees charged. The market could perform reasonably well and still not trigger any increases in Ida’s payments. 3. Some of the funds available to IncomePlus investors charge lower MERs than you quoted. The funds with lower total fees are the ones containing a lower percentage of stocks. The only way to have a chance at doing significantly better than the minimum guaranteed payments is to have as much exposure to stocks as possible. 4. The product might enable some investors, who would otherwise be too skittish, to buy into today's markets or to feel comfortable maintaining some exposure to markets during volatile times. It is true that this product’s guarantees may draw in nervous investors. However, IncomePlus behaves more like a bond than like stocks. The high fees charged prevent investors from participating in very much of the market’s upside. In the future, IncomePlus investors are likely to see positive news about stocks, but see their payments increase minimally or not at all. 5. The fact that Manulife had to inject new capital partly to boost its reserves for products of this kind suggests the product is not as one-sided as you suggest. Let’s try an analogy here. Suppose that I offer people a $1000 bet on the flip of a coin. But, they don’t realize that I’ve rigged the coin to come up my way 90% of the time. If I happen to lose the first flip and scramble to raise the $1000 I owe, is this evidence that the bet wasn’t one-sided? Manulife lost one round of a bet stacked in their favour. I like their chances in future rounds. 6. Those who bought earlier this year may be glad they did that rather than investing directly in mutual funds or equities. You are right that these people are probably glad, particularly those who need money right now. However, if our 50-year old investor Ida, who doesn’t need income until she is 65, just stays invested in a low-cost stock index and waits out the current downturn, she is likely to be better off than investors who bought into IncomePlus early this year. Despite our differences, I appreciate comments from readers. I’m more interested in learning the truth than I am in trying to argue than I’m right. Most of us dream of living the life of a millionaire. Many of us regularly buy lottery tickets, and more of us buy them when jackpots get larger than normal. However, few of us have a good sense of what is truly a large amount of money. Imagine a young guy named Jack who is 25 years old and starting a new job. We look into a crystal ball and see that Jack will average an inflation-adjusted income of $50,000 per year for the next 40 years. If you’ve never done the math, it can be surprising to realize that this amounts to two million of today’s dollars. Now if Jack were to win $1 million in a lottery, this would be only half as much as his total 40-year income. Even with investment returns, Jack would risk running out of money if he were to quit his job and spend $50,000 per year. Even if he kept his job, he would risk running out of money if he spent $100,000 per year. So, unless Jack spends his winnings quite modestly, his good fortune will be temporary, and the money will be gone in a few years. We see this fate befall many lottery winners. Sadly, many end up spending themselves into huge debts after the money runs out. They simply didn’t understand that their big prize wasn’t so big compared to the length of a human lifetime. For the average person to be able to quit working and live large, a lottery win of about $5 million or more is needed. Even then caution is required. A sequence of poor choices, such as buying a money-losing dream bar or restaurant, can easily wipe out $5 million in a few years. The truth is that most millionaires accumulated their money while living frugally. Their financial habits are an important part of what has made them wealthy. Ironically, most real millionaires don’t live like millionaires. Some may find this “dollars per day” idea depressing, but I don’t see it that way. It comforts me to realize how long my expected lifetime will be. There is a big difference between the financial crisis and the plight of US automakers. The financial crisis affected all financial institutions everywhere. US automakers are being crushed by foreign competition. The financial crisis is definitely making things far worse for US car companies, but the fundamental problem is that Asian companies make better cars. I’m not necessarily arguing against some sort of assistance for the US auto sector, but it has to be with an eye toward becoming competitive. Unless GM, Ford, and Chrysler start making better cars, they will keep coming back to government looking for more handouts. 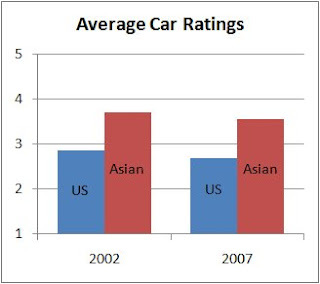 Some people dispute the fact that Asian cars are generally better than American cars. This is largely patriotism rather than reason, but let’s examine it anyway. This is a huge edge for Asian cars over American cars. Unless a bailout comes with a realistic plan to become competitive in car quality, the US government is just throwing good money after bad. This brings us to the reason for American car companies being uncompetitive. One guess is that US car companies have ploughed money into advertising at the expense of designing better cars. This may be a symptom rather than the underlying problem. Some commentators blame the unions for high costs and low productivity. I don’t know if this is true or not. If it is true, then lawmakers should make some tough decisions and solve the problem before giving out money to failing companies. There is no doubt that if any of the big three US automakers fail it will cause huge problems for the economy. However, a bailout without a plan to become competitive is a step toward a planned economy where subsidies suppress innovation. I’ve been getting a lot of requests lately to place advertising on my blog. Unfortunately, most of it is completely inconsistent with my message about how to handle money. Many are from payday loan companies. It’s sad that some people have got their finances into such bad shape that they feel the need to take loans from these companies at such exorbitant interest rates. The latest advertising request came from a web site (that I won’t name) devoted to strategies for gambling with stock options. There are some sensible uses for options, but this web site was not promoting sensible strategies. There are dozens of option strategies for ever more specialized situations. The problem is that you can’t predict the future to tell which option strategy to use. If you buy a call option, but the stock doesn’t go up, then you lose your money. If you split your money among several guesses, you will lose money, on average, due to the commissions and spreads on the option purchases. Saying “risk free” here makes it sound like the option strategies have no risk and that you’re guaranteed to make money. In fact, the “it” that is “risk free” is the expo that you can attend without paying any money. The option strategies are definitely risky. Let me reiterate that there are specialized circumstances where stock options can be part of a sensible investing strategy as a form of insurance to reduce risk. I’ve never had the need to trade in options myself, but it could come up. However, if anyone is telling you to use options to get rich, you should be very suspicious. Whenever I buy bonds through my discount broker, the commissions they charge me are hidden. When I want to buy a particular bond, they just quote me a price, and when I decide to sell the bond, they just quote me another price. There is never any mention of commissions. Of course, discount brokers don’t let you trade bonds out of the goodness of their hearts; they make money somewhere. With stocks it is more obvious. You pay commissions and lose some money on the spread between bid and ask prices. Right now I only have one bond. It is a British Columbia coupon for $14,000 coming due 2010 June 18. A “coupon” is a bond that is bought for a discount to the face value and pays no interest until the coupon comes due. So, I paid less than $14,000 for it, and will get $14,000 in June of 2010. To figure out the fees I’m charged for trading this bond I first checked what I could get for it if I sold it: $13,438.14. The cost of buying another identical bond is $13,532.82. So, the total fees charged for buying and selling this bond are $94.68. I’ve actually done this calculation twice about a week apart to see how stable these costs are. The total fees the first time were $96.01. Based on just two data points, the total cost of a buy and sell is about 0.7% for this bond. Let’s compare this to the costs of trading $14,000 worth of XIU, an index ETF of the S&P/TSX 60. I would pay $9.95 for each trade, and based on 1000 shares and a bid-ask spread of $0.02, the total spread cost of a buy and a sell is about $20. So, the total fees are $39.90. Based on this example, trading the bond is nearly 2.5 times more expensive than trading the index ETF. If any readers would care to check on their costs of trading bonds with their brokers, I’d like to try to get a picture of bond trading costs. 1. I think it’s funny that the day after CIBC predicted a market bottom (the web page with this article has disappeared since the time of writing), stock markets in Canada and the US dropped 4-5%. It seems to be human nature to listen to these predictions when all evidence shows that nobody knows what will happen to stocks in the short term. I believe those who say that current stock prices will seem low looking back 5 or 10 years from now, but that doesn’t preclude the possibility of another 20% drop in the short term. 2. Larry MacDonald makes a sensible argument that the government should not bail out auto companies. The banking system is having a short-term liquidity problem. North American auto companies have been losing the competitive battle for decades. 3. The Big Cajun Man asks if Nortel is a dinosaur, and discusses its prospects and planned reorganization. 4. Ellen Roseman asks who will be responsible for credit card fraud when credit card companies start giving us “chip and PIN” cards. Credit card companies would love to make consumers responsible for fraud based on the reasoning that the system is secure and the customer must have done something wrong. However, it is impossible to use even a chip and PIN card safely. Consumers are expected to insert their cards and type their PINs into a device supplied by a stranger. The consumer can’t control the risk in this situation. The risk should continue to be borne by credit card companies and banks. If the new technology is more secure, then the credit card companies and banks can look forward to lower losses due to fraud. 5. When negotiating, Thicken My Wallet advises: never throw out the first number. I’m left with the image of two people sitting silently staring at each other. It’s amazing how few people can withstand long pauses in a conversation. 6. Preet starts a new job, and plans to explain in his blog how the financial industry works from an insider’s point of view. He also plans to create financial products with lower fees to benefit investors. In the book “Money for Nothing and Your Stocks for Free,” author Derek Foster asks why we force kids to spend so much time “calculating the hypotenuse of a triangle,” something he can no longer remember how to do, when skills like this “are never used by most people in the real world.” He advocates spending more time teaching kids financial literacy. I agree that schools could do more to teach financial skills. However, I’m not sure how to keep vested interests from influencing the curriculum. We may end up teaching our children to buy expensive mutual funds, hire expensive real estate agents, and pay transaction fees on all purchases. The first part of Foster’s argument is that much of the math he was taught wasn’t very important. A curious thing about discussions like this is that people who lack a certain skill are often the ones who assert that the skill isn’t important. For example, I might say that knowledge of Russian literature isn’t important in investing. In reality, I don’t know if this is true or not because I know little about Russian literature. The reason that few people ever calculate the hypotenuse of a triangle in their daily lives is mainly because they can’t. Further, they wouldn’t recognize a situation where it might be useful. For example, measuring out a 3-4-5 triangle is a way to get a square corner when laying out a football field. If you have to lay out bases on a baseball diamond, it can be useful to figure out that second base is 127 feet, 3 inches from home plate by calculating the hypotenuse. I once helped a volunteer who had no measuring tape figure out where to put a new pitcher’s plate by figuring out that it should be about 3 feet in front of the line from first to third base. Opportunities to make use of a skill are often impossible to recognize unless you have the skill. Getting back to investing, I’m not arguing that you need to know calculus to succeed. In fact, people who delve too far into mathematical topics like efficient market theory and modern portfolio theory often get caught up in details and can’t see the forest for the trees. When a writer comes up with incorrect conclusions and baffles his readers with math, don’t blame the math; blame the author. Any skill is potentially useful when investing. Some are clearly more useful than others. Basic math is obviously important for investing, and I think that more advanced math can be helpful. Common sense, curiosity, and the ability to stay calm are beneficial as well. Recent stock market declines forced Manulife Financial to borrow $3 billion from the Canadian banks. This brings to mind one of the risks of buying any type of annuity including IncomePlus: default by the insurance company. The main drawback of IncomePlus is the high fees and the likelihood of not keeping up with inflation. On the positive side is the protection from a prolonged decline in stock prices. If stocks perform poorly for a long time, customers of IncomePlus will get a steady income eroded by inflation, but at least it wouldn’t drop in absolute terms. But if this doomsday scenario for stocks plays out, all IncomePlus customers will be leaning on the insurance guarantee all at once. What happens if Manulife runs out of money? Existing regulations require Manulife and other insurance companies to maintain certain financial reserves, and this was the reason for the $3 billion loan. If stock prices really do decline for a long time, creditors will eventually stop lending Manulife more money. I don’t know how deep the decline would have to be to cause Manulife to default on its promises, but this is something that potential customers should know before handing over their life’s savings. This doesn’t apply only to Manulife. Any person who considers buying any type of annuity should understand exactly what entities are backing it, and whether they are strong enough financially to make good on their promises. A member of my extended family I’ll call Don has been hit with a hard sell to buy into a Manulife Financial’s IncomePlus annuity. IncomePlus is essentially a portfolio of mutual funds with very high MERs combined with an insurance component that adds even more fees. For an overall cost of about 3.5% each year, Don is guaranteed payments each year for the rest of his life of at least 5% of his original investment. For the first 20 years, this is just a guaranteed return of his inflation-ravaged capital. If Don’s portfolio happens to grow despite the 5% withdrawal and 3.5% fee each year, there are defined times every three years when the portfolio locks in the gains, and Don’s guaranteed yearly income rises to 5% of the new portfolio size. Don would be counting on such gains just so that his income would keep up with inflation. For Don’s income to match inflation, the mix of investments in his mutual funds would have to grow in value each year by inflation plus the 5% withdrawal plus the 3.5% fees. With a 75/25 mix of stocks and bonds, and if bonds beat inflation by 2% each year, stocks would have to beat inflation by about 11% each year. This is not likely over a long period of time. So, Don is not likely to keep up with inflation unless he dips into his capital and reduces future guaranteed returns. Even using investments such as low-cost exchanged-traded funds (ETFs), it is difficult to design portfolios that provide investors with complete peace of mind due to longevity risk, inflation risk, and the risk of declining stock prices. Insurance companies can have a role to play in eliminating longevity risk, but any benefits to investors in the case of IncomePlus are more than offset by the ultra-high fees. Seeing a bar chart of income stretching on indefinitely without ever going down is comforting only as long as you don’t think about inflation. If these charts were changed to take into account a plausible level of inflation, they would cease to be persuasive. Canadian Capitalist asked “why then are advisors pushing their clients to buy these products?” I suspect he knows the answer, and it became clear to me after listening to Don. Don is contemplating a last decision about all of his savings. This includes not only the money controlled by the advisor who is pushing IncomePlus, but also his other retirement accounts. This advisor is going for the chance to get control of all of Don’s money for the rest of his life. That would give the advisor a big commission immediately and additional trailer fees indefinitely. As far as I’m aware, Don hasn’t made a decision yet. I don’t like to tell people what to do with their money, because they know their business better than I do. But, it’s not hard to tell where I stand on IncomePlus. A Barack Obama presidency is now confirmed. So, what effect will this have on the stock market? Whatever happens to stocks, we can expect the press to link it to Obama’s victory. One theory is that Democrats are bad for business, and stocks will drop in value. Another theory is that Republicans are responsible for driving the US debt to dizzying heights, and the stock market should respond positively to a Democrat as President. Or maybe the market was anticipating an Obama win, and investors will “sell on the news” driving stocks down even though they think Obama will be good for the economy. Or maybe the opposite will happen because of some sort of double-reverse psychology. I don’t know what will happen to stock prices for the rest of this week, but whatever happens, it will be portrayed as the inevitable effect of Obama’s victory. Surely some stock price movements will come as a result of random buying and selling that has nothing to do with the election. 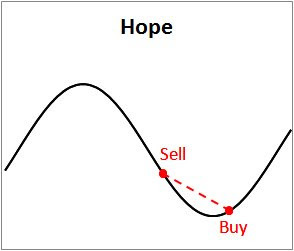 Short term price movements are mostly unpredictable, and the important thing is what happens in the long term. We can only hope that Democrats will govern in a way that leads to the economic growth that is necessary to have long-term gains in the stock market. The Better Business Bureau reports a scam that has worked on grandparents from California to New Hampshire. The scam is a variant of the loved one in trouble. In this case, a caller claims to be a grandchild traveling in Canada, in trouble, and needing a few thousand dollars. What makes this scam so effective is a combination of factors. Grandparents are very likely to want to help a grandchild. Voices can be difficult to recognize on the phone, especially if the grandparent hasn’t seen a teenage grandchild in a while. Traveling in Canada is quite plausible for a young American. Lastly, Canadians are far too nice to run a scam like this. I’m disgusted with these thieves, but somewhat impressed at the same time. This scam is quite clever. If these criminals put their abilities and some hard work into an honest venture, they probably would do well. Some people are willing to work very hard to avoid having to do any work. This week I got my notice from the government about how much they think my house is worth. They clearly didn’t spend much time on my house because my assessment went up by exactly the average amount in my area, 13%. Fortunately, this doesn’t mean that my property taxes will go up by 13%. City governments don’t collect more taxes when property values rise and less when property values fall. What actually happens is the city decides on the total amount they will collect from homeowners, and then divides that amount among homeowners in proportion to assessed property values. For example, if the city needs $1 billion from us, and the total value of all houses is $80 billion, then the tax rate is set at 1/80=1.25%. A house worth $320,000 would pay $4000 in property taxes. If property values had plummeted to a total of $50 billion, then the tax rate would have been set at 1/50=2%. The house that was worth $320,000 in good times is probably worth only $200,000 in bad times, but would still pay $4000 in property taxes (2% of $200,000). With this type of system, what really matters to your property taxes is how much the value of your house rises compared to everyone else. Suppose that the city increases taxes by an average of 5% from last year to this year. My house’s assessed value went up by exactly the average amount, 13%. So, my tax increase will be 5%. If my assessment had gone up by 17%, then my taxes would have gone up by about 4% more than average, or about 9%. One other wrinkle for my area is that new property values will be phased in over four years. This was done to reduce the shock for homeowners whose assessments changed dramatically. If no new assessments are done in the next four years, then I can look forward to paying exactly the average tax increase each year. If my assessment had gone up by 17% instead of the average 13%, then I could look forward to seeing my property taxes increase by about 1% more than the average for each of the next four years. A group of regulators of the Canadian mutual fund industry have come up with a proposed new set of rules for disclosing information to potential investors using mutual fund fact sheets. Don’t look for any big differences to help investors understand what is going on. These fact sheets don’t even have to include a fund’s trading costs. As explained in an Ontario Securities Commission article Understanding Mutual Fund Fees, “brokerage charges, which are the fund’s cost of buying and selling securities in its investment portfolio, are paid by the fund but are not included in the MER.” These costs are buried in other disclosure documents as a Trading Expense Ratio (TER). To those of us who have an interest in financial details, the disclosures about fees in the fact sheets seem clear enough. But, I doubt that the average investor could make a meaningful connection between this information and actual fees paid. When friends and family show me their account statements, they are usually shocked when I tell them how much they pay in fees. A problem with the fact sheets is that they are disconnected from the purchase of units in a fund. Whenever an investor buys units of a mutual fund, there is some piece of paper or browser screen that shows how much the investor pays for the units in the fund. I’d like to see two additional numbers related to fees written beside the transaction information: assuming that the units are held for 10 years, what will be the total amount charged in fees, and how much of this goes to the advisor. Let’s try an example. An investor decides to move his $50,000 RRSP into the biggest Canadian mutual fund that will take an investment of this size, Investors Dividend-A. This fund’s MER plus its trading expense ratio comes to 2.70% per year. According to the fund’s prospectus, advisors get 4.10% of the sale plus an additional trailer of 0.63% per year. This type of disclosure concerning mutual fund fees would be much easier for investors to understand than the information in fact sheets. It might cause investors to ask questions about fees and even do some comparison shopping. In case that didn’t make much sense to the average reader, let’s break it down. A securitizer is an organization that collects loans into a big pile and then sells fractions of this pile to others. This doesn’t mean that they sell off each loan individually. If someone buys 1% of the pile of loans, that person will own 1% of every loan in the pile. Greenspan is suggesting that the securitizer should not be allowed to sell the whole pile of loans, but should have to keep some fraction of it. This leaves the securitizer with some meaningful fraction of every loan. How would this help? Well, the assumption is that at least some of the securitizers knew that the loans were bad, and that they were selling bad investments to others. But, they didn’t care because they were able to sell off all of the bundled loans for an immediate profit. If the securitizer had to keep a fraction of the pile of loans, it might think twice about buying too many really bad loans. During the bubble, there were many securitizers playing a game of hot potato. They made money by buying overpriced products and then selling them for an even higher price to a bigger fool. If all securitizers had to hold on to a fraction of the bad loans they buy, they would be pickier about which products they buy. This would severely reduce the demand for potential mortgage holders who have little hope of keeping up their payments. Greenspan’s rule would force middlemen to take a more long-term view. Instead of making an immediate buck by passing on the hot potato to a bigger fool, the middlemen would have to make some of their money by actually collecting on loans.